If you arrived here looking for an article on the Blues Music Awards, scroll down past this new post or click here. 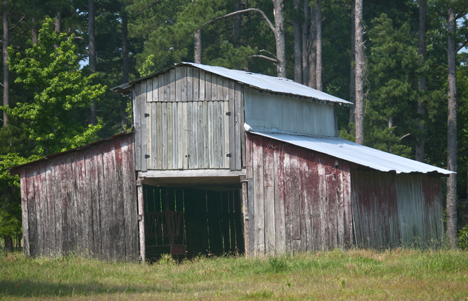 Just off U.S. Highway 63 south of Pine Bluff, Arkansas, this old barn was high on my list of requests to shoot. It is in good condition and sits in a well maintained pasture alongside the highway. There is a tad of lean to the right side. A big benefit of residing in a not-to-terribly-large metro area is that you are still close to the last vestiges of the former predominantly rural society experienced by our parents and grandparents, to wit: old barns. The barns you see on this post are prima-facie evidence of that benefit. They are no further than 10 or 15 minutes from my humble abode. Though many of our remaining barns are crumbling and/or on the verge of collapse, for a lot of folks, these old structures exude a certain panache and charm not otherwise available. I am one of those so infected. A goodly number of my similarly afflicted friends asked me to shoot the one you see above and one you will find on the Photo of the Week Page at Corndancer dot-com. The one you will see at Corndancer has deteriorated far past the one you see above, so get a good look. The next warhorse storm could convert it to kindling wood. Taking a closer look at the old barn on Highway 63, it appears to be in better condition than many of the old barns I have photographed. 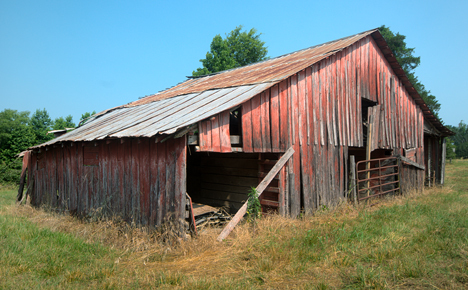 The remaining red is makes for a great old barn patina — just the thing that makes barn aficionados salivate. Just a hop, skip, and jump south on Highway 63 from our red barn, turn right on Mount Harmony Road. It won’t be long before you see this barn. It is in good condition and was apparently in place before the neighborhood which has built up around it. 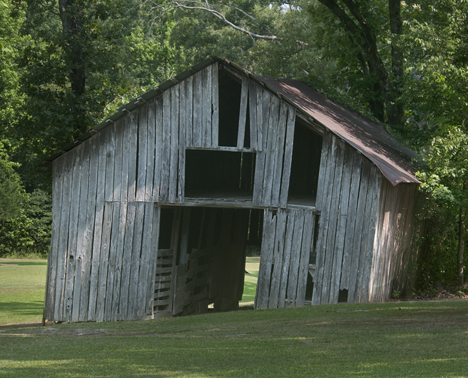 Stay on Mount Harmony Road for a mile or so and you will come across this leaning barn. It is near a residence and sits in a large well-tended yard. This view is available from your vehicle. In fact, I did not leave the truck to get this shot. And now my friends, I am giving you the bird! When I arrived at the red barn, I noticed a bevy of birds perched on the entrance gate. The birds kept a wary eye on me but did not fly while I snapped the long lens to Mr. Nikon. They even stayed in place while I shot out the window. As soon as I stepped out the pickup door, they launched. This critter was the most intriguing of the bunch. 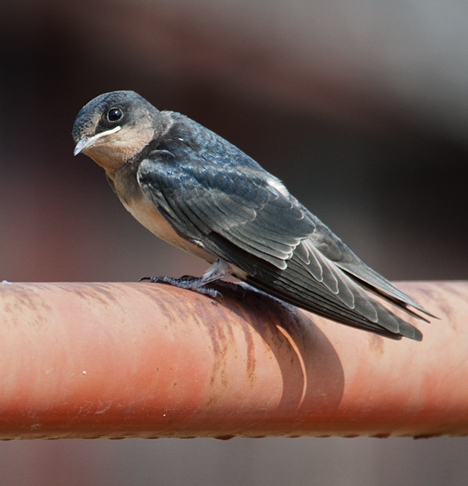 I’m not certain, but I’m thinking the bird is a immature Purple Martin. Please correct me if I am wrong. 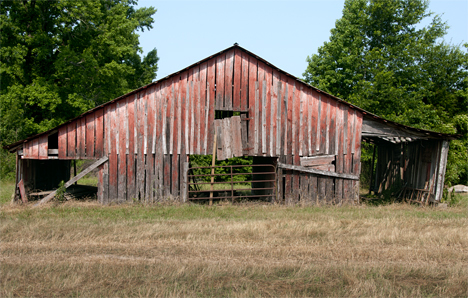 Remember, as much as you may enjoy seeing old barns, the pleasure is fleeting. Enjoy now before it’s too late. That’s meaningful for other things too. Top of the blues to ya! 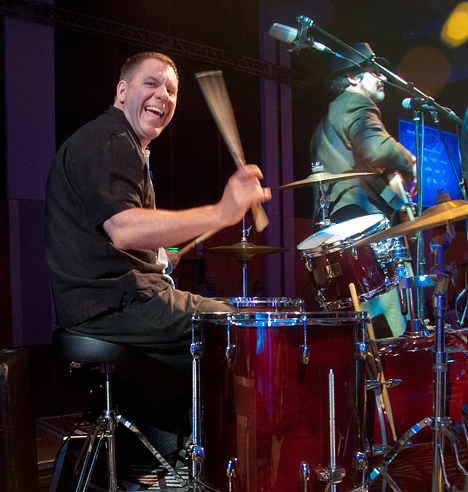 This drummer seems to be having the time of his life as he performs with his band in the 2012 Blues Music Awards in the Cook Convention Center in Memphis, Tennessee, May 10, 2012. I had to squeeze my ungainly frame between a couple of shipping containers to get the shot but cannot argue with the results. Being a blues fan and a photographer — and hovering around the stage — and shooting the 2012 Blues Music Awards at the Cook Convention Center in Memphis, Tennessee is a highly desirable combination of circumstances I recently enjoyed. You can get in on the start of this story on the Photo of the Week Page at Corndancer dot-com. We’ll wait here until you come back. The room was packed with performers and blues fans from around the planet, in fact, you’ll see a picture of international blues standout Ian Seigal below as he performed in the program. The format of the program alternated between conferring awards with performances by bands and individuals, many of whom received awards that night and previously. It was hold on to your hats, let the good times roll. Before the night was over the audience was dancing in the aisles. Upward to 2,000 attended the event. Attendees dictated the dress code which went from black tie to blue jeans — and it was all smiles. Eric Bibb, 2012 Blues Music Award Acoustic Artist of the Year turned in an energetic performance. As you watched and listened you knew that every fiber in his being was going into his tunes. As an art form, the Blues is purely American and purely southern in it roots. Past that, you’ll find blues fans in every corner of the earth. Though the uninformed might consider the blues to be a somber expression, nothing is further from the truth. In most performances, even the most jaded cynics can be seen tapping their fingers or moving their feet. The true believers are playing air guitars and grinning from ear-to-ear. It was that kind of night. The music was infectious in a good sort of way. Wayne Russell, normally found playing bass in the Reba Russell band (she’s his wife), was providing his stellar services to another band in the program. Russell is not only a talented musician but is a gifted visual artist as well. Ian Siegal performs in the 2012 Blues Music Awards. The misty appearance adds some oomph to to the back room blues ambiance of this picture. Grady Champion who bills himself as “The Mississippi Bluesman” was the closing act. As the program wound down, he wound up and had the audience on its feet, clapping, tapping their feet and dancing in the aisles. Everyone left with a smile on their faces. Mind you, the program runs from 7:oo p.m. until 1:00 a.m. At 1:00 a.m., there was still a respectable and happy crowd left. As he whipped the audience into a happy frenzy as the closing act, Grady Champion turned to me and smiled. I took the hint. I shot just over 2,700 exposures and filled four 8-gig cards and part of another. I selected 107 images to include in the galleries linked below. You should get an idea of the great celebration by taking a tad of time to peruse the pictures. Back in November of 2009, I ran shy of current subject matter and was compelled to dig into the archives to populate the Weekly Grist and Corndancer Photo of the Week pages. I found the ones I wanted, mostly unrelated, including a fox, some alligators, a bear swimming in deer grass, a locomotive, and one super cool monkey. I put the fox and gators on Corndancer. I put the bear, monkey, and locomotive on Weekly Grist. Click here to see the original post and marvel. The fox and the gators bear inspection on the Photo of the Week page at Corndancer dot-com, where we discuss the conundrum the fox versus the gators: How we consider warm and fuzzy versus low, long, toothy and perhaps slimy — while both are God’s critters. There is no good answer, but it is a pretty good read. Given that these critters were adults when I shot them years ago, most have probably ascended to the big critter home in the sky, so this is a memorial to them. Well maybe except for the gators who can live up to 50 years and still may be scaring the socks off of those with weak stomachs. I guess that’s how God makes up for ugly.